Table 1 shows the net present value of loss as a percentage of the initial balance. Clearly the loan type and forecast makes a very great difference to the Expected Loss. Note especially the effect of including the creditworthiness of the tenants in Loan B compared with Loan A. To give deeper insight, the graphs below show the CECL projected over 5 years for each of the forecasts. For most of the deals the most important risk is refinancing, however Loan D suffers badly in the year of the lease expiration. 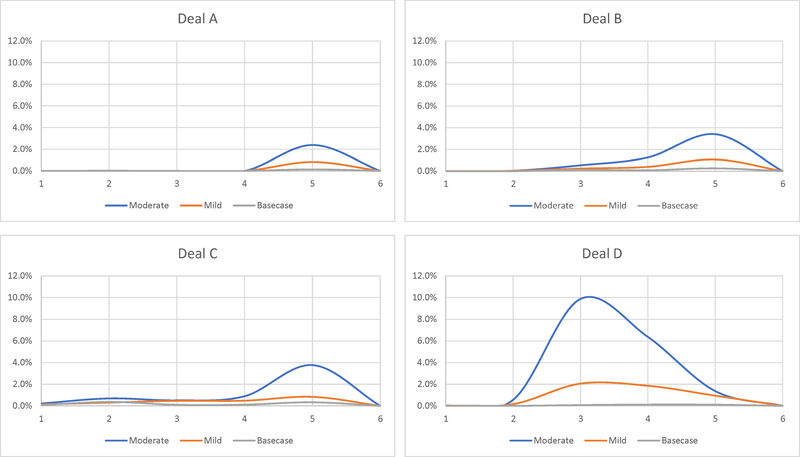 This brief analysis illustrates that forecasts have a significant influence on the CECL and that the degree of influence depends on the deal type and information included in the analysis. 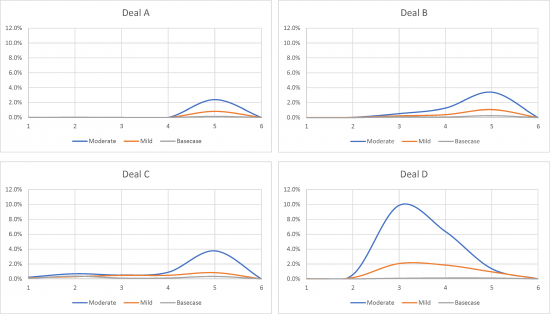 With capital and accounting both depending on the measurement of risk, there are plenty of opportunities for arbitrage and mispricing. The next paper shows the effect of risk-mitigants such as covenants.